HappiJac’s innovative Frame Mount Tie Down System uses leverage to its advantage. Its combination of frame strength and sound engineering creates an I-beam truss structure that makes your camper one with the truck. 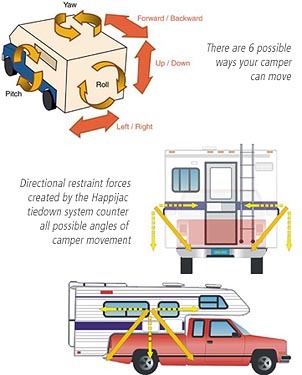 Its Direct-to-Frame mount is strong and easy to use, and there's no other like the HappiJac Tie Down that prevents camper movement in all directions (up-down, side-to-side, and front-to-back). Hitchweb is proud to support Happijac products in Canada. 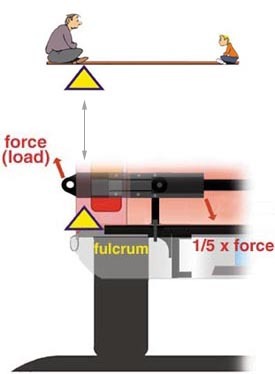 Using Happijac's anchor points with Happijac turnbuckles, it creates structural strength by triangulating leveraged counter forces. This configuration provides total control of front-back, up-down, and side-to-side movements. It also controls the yaw, pitch and roll of the camper. Here's a simple diagram of how Happijac works. What is the Best Camper Tiedown Brand? I Can't See Behind my Camper What are Happijac Tiedowns?